Still looking for the best Christmas dress for the girls? Don't fret you still have time to order from Elitedresses and have it shipped in time for Christmas. There are lots of girls Christmas dresses to choose from and surely your little girl will love them! 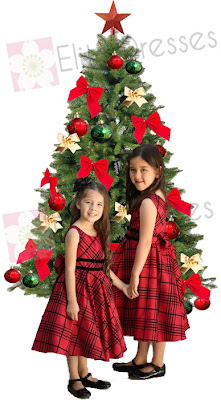 You can also opt for a cute matching Christmas dresses for sisters. They will surely look great in a matching ensemble and will be perfect for the Christmas family photo. Elitedresses.com provides top quality girls party dresses for your kids. Prices are reasonable, shipping policy is fair and we strive to be awesome in our customer service. Shop the Elitedresses styles this Holiday season! Your christmas costume photo is superbly awesome. Love your Christmas pic!